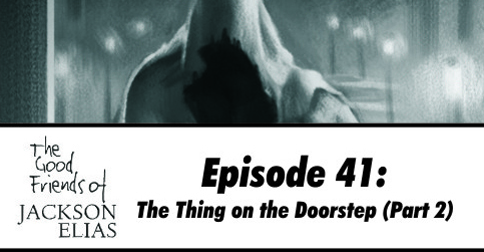 We’re back and we’re wrapping up our look at H P Lovecraft’s The Thing on the Doorstep. This is the episode containing all the bits you wanted to hear last time, but were bumped because we talked too much. Every time we record an episode about a Lovecraft story we promise we’ll keep the synopsis short, yet we never do. Maybe its time we acknowledged our rambling problem and dealt with it like mature adults, through heavy drinking and denial. Burying your head in the sand always seems like a good idea up to the moment it gets eaten by chthonians. In particular we mention the few film adaptations to date (although it seems there’s a new one we missed, so I’ve embedded the trailer below by way of recompense) and, more pertinently, ideas about using elements of the story in your games. Definitely just in games. The Good Friends of Jackson Elias recommend against stealing the bodies of family members, as it can make Christmas dinner even more awkward than usual. Be warned that there are some spoilers for an old Chaosium scenario that uses elements from The Thing on the Doorstep. It’s difficult to warn you which one, as the spoiler is that it uses these elements, so mentioning its name is a spoiler in itself. When we start talking about it, fast forward for a minute or so if you don’t want to know, or if you’re just getting bored of listening to us. I fast forward myself the whole time. First of all, please let me thank you for this great podcast! I recently discovered it and I am slowly catching up to your current episodes. You point out that Derby has access to the mythos at the tender age of 16, long before he has had any chance to read mythos tomes in the Miskatonic University library. One of the parallels I was reminded of was Wilcox in “Call of Cthulhu”. Wilcox has these dreams of Cthulhu and R’lyeh without having any clear understanding of what he is experiencing. This led me to think of a couple of threads we could pick up on to make sense of the fact that a precocious Darby has written something that gives insight into the mythos. First, perhaps Derby is “psychically hypersensitive” just like Wilcox was, and that something in the cosmos was ripe to catch a glimpse of Azathoth (just like it was ripe for Wilcox to get visions of Cthulhu). Also, what strikes me as most intriguing is the idea that Lovecraft may be borrowing something from the Romantic poets here: both Wilcox and Derby could be divinely inspired. Of course, the Romantic poets thought it was the Christian god who inspired artists, but in the context of Lovecraft’s view of the cosmos, entities like Azathoth or Nyarlathotep might actually be the ones who inspire artist of various kinds (especially ones who are hypersensitive). When a divine being inspires an artist, the artist becomes a mouthpiece for the divine. Now in terms of gaming, playing an investigator who has been inspired in the past does not necessarily have to translate into having an initial mythos score. An artist might be inspired to create something (a clay bas-relief of Cthulhu or a book of poetry about Azathoth) without having any understanding of what he or she is doing. 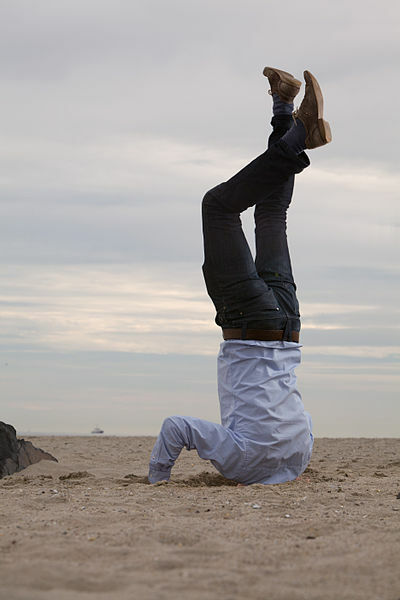 Wilcox certainly didn’t, and that’s why he sought out Professor Angell. Perhaps Derby didn’t understand either, and that could explain why he sought out the mythos books in the Miskatonic University Library. This possibility also offers a solution to one last difficulty: if Derby does not understand what he wrote, how is it that others (investigators or NPCs) can acquire some mythos knowledge by reading his poetry? The answer I propose has something to do with the idea that Derby was inspired by Azathoth (as in, he became the mouthpiece of Azathoth). Derby might not understand the revelations of Azathoth, but others who have had first-hand knowledge of the mythos, who spend a lot of time studying his book, or who can correlate the information with other tomes could learn something from it, since it does provide insight into the true workings of the (Lovecraftian) cosmos. If someone in my group wanted to play someone like Darby, I might allow their investigators to have had some visions in the past, but I would stipulate that their investigator does not understand the meaning of these visions. I might use the visions to foreshadow something that will happen in the game. I actually think it might be a very useful narrative technique. Anyways, before I ramble on for too long, let me once again thank you for a fine podcast! I am learning a lot and getting a lot of ideas from you guys. That’s a fantastic take on things, Jean-Philippe! I especially like the idea of Derby not understanding the blasphemous wisdom he is channelling. It reminds me a bit of Aleister Crowley’s accounts of the creation of the Book of the Law, where his wife purportedly became a conduit for the spirit Aiwass, leading them to transcribe his pronouncements, only in a more naive manner.